A number of battered wooden boats carrying dead bodies have mysteriously washed up on the shores of Japan—and experts say they could be from North Korea. Three empty boats were found along the west coast of Japan on Dec. 7. Two skeletons were found near one of the boats, which was upturned on the shore near the city of Oga, reported Washington Post. One of the other boats that was caught in fishing nets near Sado Island bore a sign in Korean writing. Since November this year at least 40 corpses from around 15 boats have washed up along Japan’s west coast, according to Business Insider. Japanese authorities have not been able to definitively establish the nationalities of the bodies, however, evidence points to the reclusive communist state. Last month, one body was found in a small wooden ship on the island of Sado. In the ship, authorities found what appeared to be North Korean cigarette packets and jackets with Korean lettering on them. 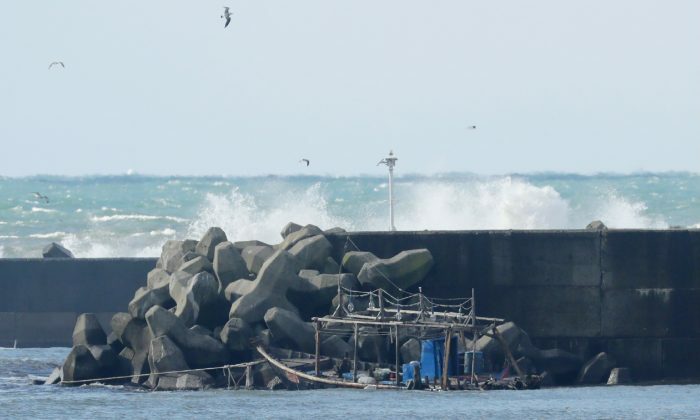 More recently, two bodies were recovered from another boat in Yamagata prefecture on Dec. 7. They were wearing badges showing the face of Kim Il Sung, the grandfather of Kim Jong Un, according to the Associated Press. Japan is no stranger to these “ghost ships”—ships with no living crew. These vessels have been arriving in Japan from North Korea in previous years. According to a political science and economics professor at Japan’s Seigakuin University, Satoru Miyamoto, 80 similar ships have drifted into Japanese shores in 2013, 65 in 2014, 45 in 2015, and 66 in 2016, reported Business Insider. However, in November alone 28 boats were found—a sudden spike in the number of discoveries compared to four boats same time last year. This phenomenon has people thinking about what is going on. The communist regime has been responsible for several famines resulting in millions of deaths. Analysts believe that the toughening of sanctions on North Korea for its nuclear defiance is having an impact on their food supply. “North Korean fishermen have to work harder than ever before, and they have to go farther out into the sea, but they don’t have new boats,” Atsuhito Isozaki, associate professor of North Korean studies at Keio University, told the Washington Post. “Plus, North Korea doesn’t have enough gasoline anymore, so they’re running out of fuel,” Isozaki added. “Fishermen usually have a set quota, and they used to sell the seafood to China,” Toshimitsu Shigemura, emeritus professor at Waseda University told the Washington Post. “Now with the new sanctions, they can’t sell the seafood overseas, but the quota still exists, so fishermen need to go fishing. They probably stay out too long to catch more fish,” he added. In addition to the sanctions, the communist regime had also suffered a severe drought in July this year which significantly reduced the country’s food supply and will likely lead to further food shortages, according to the Food and Agriculture Organization of the United Nations (FAO). Kingston said the appearance of these ships is a sign of desperation as North Koreans try to make up for the food shortages. “These rickety vessels are unsuitable for the rough seas of the Sea of Japan in autumn, and one imagines that far more are capsizing that we will never know about,” Kingston told Business Insider. Not all boats that have arrived on Japanese shores contain dead bodies. According to the Washington Post, a total of 42 men have been found alive, with one boat carrying eight North Koreans fishermen who were looking for squid when their engine failed. Kazuhiro Asai, head of the Oga branch office of the Akita Fisheries Cooperative Association, said that they feel unsettled about the North Korean recent appearances. “In the past, there was a case where North Koreans came to kidnap someone nearby, and that was scary. I guess these guys aren’t out to kidnap, but we don’t know what they’re here for, and that makes me worried,” Asai told the newspaper. Other people living on the Japanese coast said that along with missiles in the water, these “ghost ships” are another thing they have to watch out for from their hostile neighbor. “We have an uneasy feeling,” Sakari Nishimura of Yamagata Prefectural Fisheries Cooperative Association, told the newspaper. “These days, we not only need to watch out for missiles falling from the sky; now we have to watch out on the sea, too,” he added.